August 23, 2018, was back-to-school day for 20 FirstService Corporation employees who visited the Bendale Business Technical Institute (Bendale BTI) campus. But instead of carrying backpacks and laptops, volunteers donned gardening gloves and garden tools. This back-to-school day was different than most. On this day, the team volunteered to tend to the vegetable gardens at Bendale BTI as part of a community service initiative to support FoodShare Toronto, a non-profit organization established in 1985 whose mission is to partner with communities and schools to deliver healthy food and education. FoodShare’s School Grown is an innovative schoolyard farming project, where fruits and vegetables are grown on school lawns and rooftops to create student employment. Students learn it all – from seeding to weeding, to harvesting produce and running their own farmers markets twice a week in two locations in the City of Toronto, Borden Farmers Market and East Lynn Farmers Market. School Grown produce is shared with students, sold to the public at local farmers markets and donated to food share programs to support the culinary classes and lunches at Bendale BTI and Eastdale CI. Bendale BTI launched its garden on a ¼ acre of school lawn in 2010. In addition to learning horticulture, students get to harvest and cook garden-grown produce, helping them to establish healthy eating habits and lifelong skills. The results of the program have been impressive. During the summer months student employees are off for summer break so volunteers are needed to help tend the gardens. 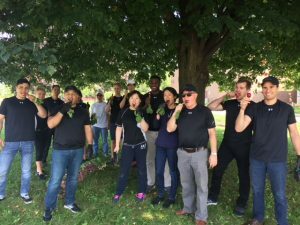 The FirstService team was looking for a teambuilding event which included a community service component as part of its #FirstServeOthers initiative, and that could accommodate 20 volunteers — which can be a challenge to find. FoodShare Toronto was a perfect fit. Orlando Martin Lopez Gomez, Bendale BTI’s Urban Agriculture Manager, educated participants about the program and the varieties of produce grown on-site. He divided the group into teams who were each tasked with different duties including weeding and tending to the tomato plants. Before long they got to dig in and begin the rewarding task of harvesting fresh produce. 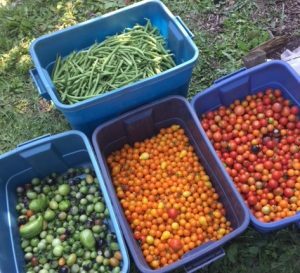 Turnips, radishes, tomatoes, and beans were all harvested, cleaned and packed – ready to be taken to the farmers market for sale. Along the way, volunteers got to sample a wide range of organic produce including colorful and sweet tomatoes, kale, peppery arugula, spicy radishes, several varieties of lettuce and even raw okra. This was an eye-opening experience for many who had no idea such urban farms existed in the city, and certainly not on school grounds. For more information about the wide array of programs offered by FoodShare Toronto please visit www.foodshare.net.